Setouchi Triennale 2016 continued to pursue the theme Restoration of the Sea. It commenced on March 20, 2016 and was held over three sessions, spring, summer and autumn, for a total of 108 days in Takamatsu and Uno ports and on the 12 islands of Naoshima, Teshima, Megijima, Ogijima, Shodoshima, Oshima, Inujima, Shamijima, Honjima, Takamijima, Awashima and Ibukijima. New art works and events were added with particular emphasis on this year’s sub-themes: the region’s connections with Asia and the world via the sea; the Setouchi Food Project; and sharing regional culture, such as lion dances and bonsai. Over 1 million visitors from Japan and abroad came over the course of the three sessions. 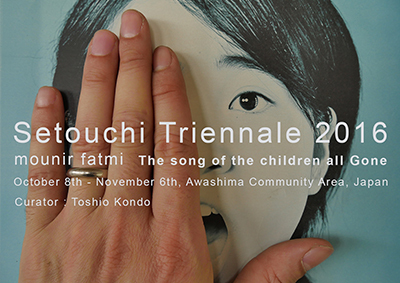 This demonstrated the popularity of the Triennale’s unique approach, which allows visitors to experience the nature and culture of the Setouchi region and its islands through a wide array of site-specific works and projects. The number of foreign visitors rose dramatically. This was due in part to the establishment of additional international routes connecting Takamatsu Airport to other parts of the world and in part to the increase in overseas exposure with each Triennale. The number of repeaters also increased as did the length of time each visitor stayed in the area. In addition, a greater number of people visited sightseeing spots that were not part of the Triennale. The Triennale also generated many other benefits. The influx of visitors not only enlivened the islands during the Triennale but also sparked local initiatives directed at revitalization. In addition, media coverage by newspapers, television and magazines raised the reputation and increased the visibility of Kagawa prefecture as a whole. Many local people were actively involved in making this Triennale a success by helping with the production of art works, manning the reception desks, offering food and hospitality that reflected local customs, and greeting and sending off visitors at the ports. Such efforts, which also contribute to revitalizing local communities, increased noticeably, indicating that they are becoming an established feature of the Triennale.